You are here: Home / Moles / What Are the Different Types of Moles? Moles are insect-eating mammals that are distinct from rats, mice, and rodents. They have cylindrical bodies that are covered with fur. Their eyes are usually not visible, although moles are not, as commonly believed, completely blind. Their ears are usually not visible but most moles have acute hearing. Most moles have paws that resemble human hands except for the presence of a second thumb, covered with fur and growing perpendicularly out of the wrist. They have short powerful limbs that enable them to dig at astonishing speeds, some species capable of “swimming” through loose soil. The “true moles” are small, hairy, cylindrical digging animals with tubular snouts. The biological family that comprises the true moles is the genus Talpidae (moles, shrew moles, and desmans) in the order Soricomorpha (a classification of animals also including shrews and hedgehogs). True moles nurse their young at the mother’s breast. Certain other species of moles carry their young around in pouches like opossums or kangaroos or give birth through a cloaca, which is a single canal for birth, urination, and defecation. The New World moles are are all true moles. They live in most of North America except the deserts of northern Mexico and the southwestern United States and the permafrost regions of Canada. The most common New World mole is the common Eastern mole, which lives ranges from Texas to Florida north to the Midwest and southern New England in the United States. This mole has black fur and an elongated body. It prefers to eat earthworms, but it will also eat grubs and dead roots and leaves. Its favorite habit is a golf course. A common Eastern mole usually grows about 190 mm (a little over 6 inches) long, including its 30 mm (1-1/4 inch) tail, and weighs about 75 grams (about 2-1/2 ounces). All common eastern moles have an orange stripe on their underbellies. The stripe is brighter in males. The star-nosed mole is common in eastern Canada and the eastern United States, although it has been sighted as far south and west as Texas. This mole has 22 finger-like projections surrounding the tip of its snout. It is an excellent swimmer, capable of foraging for insects on the bottoms of shallow streams and ponds, and a powerful digger, capable of tunneling through the snow. Most homeowners are unlikely to see this mole except during floods. The broad-footed mole, coast mole, and Townsend’s mole live in western North America from Baja California in Mexico ranging up to British Columbia in Canada. These species of moles tend to stay in the wild, the broad-footed mole preferring to live at elevations around 3000 meters (9500 feet). The European mole ranges from the United Kingdom across most of Europe and into Russia. It lives in burrows that it is constantly extending. It lives primarily on earthworms, but it may also dine on centipedes, beetles, small mice, shrews, and other moles. European moles usually have gray fur, but its fur may be taupe, mauve, brown, black, or white. Shrew moles but not mole shrews are included in the true moles. Shrew moles include True’s shrew mole and the Japanese shrew moles. Both species occur only in Japan. In China there are Anderson’s shrew mole and the “inquisitive” shrew mole, among others. The shrew moles in China and neighboring countries to the south have visible ears and small feet that are not capable of burrowing. The zoological classification of true moles also includes the desmans, river-dwelling moles that are found in the Pyrenees of northern Spain and southern France, and also along the Volga River in Russia. The Russian desman was once hunted for its thick reddish-brown fur but is now a protected species. There are also several animals that look like moles, and that are sometimes called moles, but aren’t true moles. 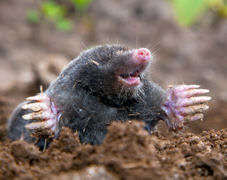 The golden moles of South Africa are more closely related to elephants, aardvarks, and sea manatees than to true moles. However, golden moles burrow in sand, sometimes “swimming” through sand, and catch insects. Golden moles have a cloaca (described above) and their kidneys are so efficient that they do not need to drink water at all. The marsupial moles of Australia are related less closely to true moles and more closely to kangaroos, wombats, Tasmanian devils, and koalas. They bear their young in pouches and feed on caterpillars and beetles rather than on earthworms. If you are dealing with a mole in your garden or own your lawn in the USA or Canada, chances are that it is a common Eastern mole if you live east of the Rocky Mountains, or one of the three species of Western moles if you live west of the Continental Divide. If you live in the UK or Europe, chances are that you are dealing with the European (also known as common) mole. Moles in Europe tend to do much more destruction to the landscape than moles in the USA and Canada, but moles in the USA and Canada are far more likely to carry the fleas and ticks that can carry human infectious disease, which is why using mole traps has become so popular. Does the Law Allow You to Kill Moles? In most parts of the world it is legal to kill moles however the methods you are allowed to use vary depending on where you live. 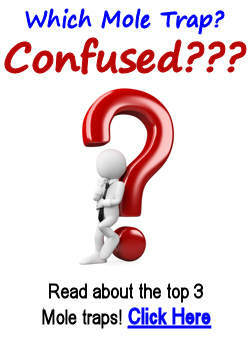 Read about the various methods here.